But the £3bn clean air strategy does not include a scrappage scheme, calling previous ones "poor value" for money. If those measures do not cut emissions enough, charging zones could be the next step - but the government says these should only be used for "limited periods". The timetable for councils to come up with initial plans has been cut from 18 months to eight, with the Department for Environment, Farming and Rural Affairs (Defra) wanting to "inject additional urgency" into the process. 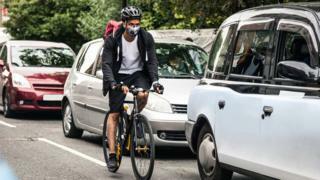 It follows the government being given its own deadline of 31 July after High Court judges said it was failing to meet EU pollution limits. The funding pot will come from changes to tax on diesel vehicles and reprioritising departmental budgets - the exact details will be announced later in the year. Councils could change road layouts, retrofit public transport, and encourage local people to leave their cars at home. A Clean Air Fund would allow local authorities to bid for additional money to put in more air quality control measures. A new Automated and Electric Vehicles Bill will allow the government to require the installation of charge points for electric vehicles at motorway service areas and large fuel retailers. Local Government Association environment spokesman Martin Tett said the plans to allow councils to switch their focus from monitoring air quality to improving air quality was the right move and welcomed the additional funding. However, he opposed the view of the government to hold off on a scrappage scheme, arguing "this immediate intervention could help increase the uptake of lower emission vehicles". The AA said significant investment would be needed to install charging points across the country and warned the National Grid would come under pressure with a mass switch-on of recharging after the rush hour. BMW announced on Tuesday that a fully electric version of the Mini would be built at the Cowley plant in Oxford from 2019. So how will the air be cleaned up? Plans for a diesel scrappage scheme for old vehicles have been rejected by the Treasury as poor value for money. They may be reconsidered in the autumn. The government has told councils to solve pollution on their own streets by improving public transport and considering restrictions on dirty diesel vehicles at peak times. If that doesn't work, councils will be told to charge diesel drivers to come into towns. The councils aren't happy to take the rap for the controversial policy when it was the government that encouraged the sale of diesel vehicles in the first place. Today's government plan is not comprehensive - it doesn't address pollution from construction, farming and gas boilers. And clean air campaigners say the government is using the 2040 electric cars announcement to distract from failings in its short-term pollution policy. He said more incentives were needed now, otherwise urban air quality would not improve. Chief executive James Thornton said the law found ministers must bring down illegal levels of air pollution as soon as possible. Green Party MP Caroline Lucas welcomed a ban but said it did not go "nearly far enough or fast enough". Friends of the Earth said the plan was a "cynical" move which passed the buck of saving lives to local authorities. Video Can China's cars kill off petrol?